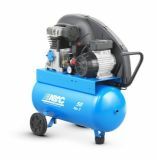 Direct drive & belt drive piston compressors. The ABAC direct drive units offer a user friendly, reliable and compact design. The ABAC belt driven units are now equipped with the new and efficient slower running pump, giving noticeable noise reductions and much lower running teperatures. The new belt guard design improves cooling air flow over the pump, further increasing reliability.